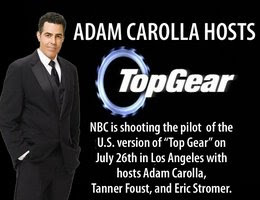 Come see your favorite radio and TV host, Adam Carolla, as he hosts the in-studio shoot of the "Top Gear" pilot for NBC! Joining him, to co-host, are champion rally and drift racer Tanner Foust and TV construction guru Eric Stromer. "Top Gear" will feature irreverent humor and camaraderie, epic races, outrageous stunts and challenges, unique celebrity guest participation and eccentric methods of testing cars. Wish I lived in Southern California. Carolla is a badass and a true car nut, can't wait to see the show.